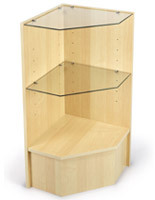 Attractive register stands and retail display cases don't have to break your budget. 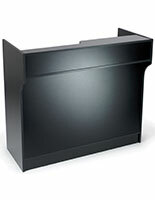 That is why we include these economical wrap counters in our retail showcases category. 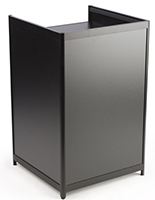 No longer do you have to be burdened by the high costs of cash stands or glass display showcases. 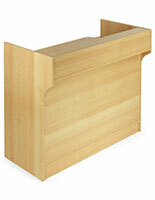 Our maple melamine wrap counters are an affordable way to furnish your retail store. 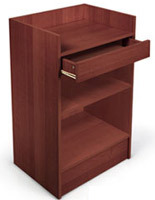 Keep your cashiers organized! These wrap counters have plenty of room for storing all the items necessary for handling customer requests. 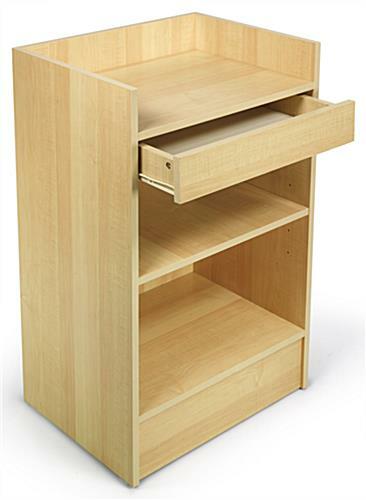 With adjustable shelving, you can even make room for larger items, like returned merchandise and hangers. The recessed top of the register stand not only protects your register, but it also hides the unsightly mess that power cords can create. These wrap counters also have a pull out drawer for additional storage of small items such as pens and return slips. 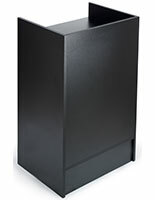 With such wrap counters as these cash stands, your cashiers and employees will have everything they need to take care of customers right at their fingertips. Wrap counters are essential for completing your retail store. Combine wrap counters with coordinating glass display showcases or glass display units to create complete service counters that fit your store's needs. 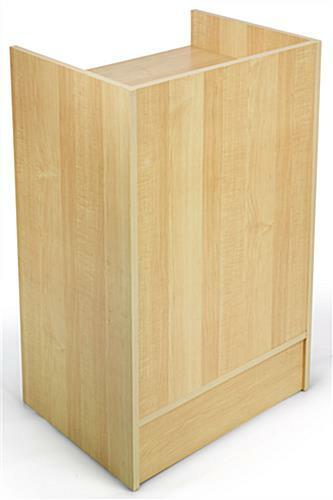 And because of their attractive maple melamine finish, register stands like these wrap counters will finish off your business in style. Unlike some of the other items in our retail showcases category, we sell these wrap counters knocked down.